"The Young Bucks", Matt and Nick Jackson. 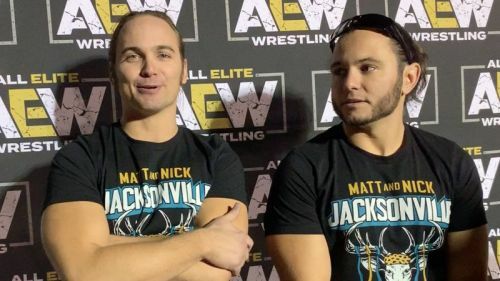 The Young Bucks recently took a moment out of their busy schedule to discuss Kenny Omega's signing and whether they ever had any fear that he would've joined the WWE or another rival wrestling promotion. Kenny Omega parted ways with NJPW in mid-January, leaving his future in doubt. Realistically, Omega had a good handful of companies he could have signed with, the top two being the WWE of course and the upstart AEW. After weeks and weeks of speculation, Omega finally made it official that he was going to be signing with All Elite Wrestling and become a fellow Executive Vice President alongside Cody Rhodes and The Young Bucks. The Young Bucks had an interview with SportingNews.com where they discussed Kenny Omega's signing to AEW, along with the fear that he could have winded up in the WWE or in another wrestling promotion. "Nah, we knew the whole time,” Nick Jackson said. Matt Jackson added, “I’ll tell you this right now: Kenny was the missing piece. I talked earlier about how Tony called me originally and got on the phone with him and he told me we need Kenny. We need The Elite. I need the best wrestler in the world and I need the best tag team in the world. That was it. All-Elite Wrestling (AEW) will be presenting their first live event for the company, 'Double or Nothing' on May 25th from the MGM Grand in Las Vegas, Nevada. So far, five matches have been officially slated for the event. Kenny Omega will face Chris Jericho in the main event in a return Grudge Match. Cody Rhodes will face an opponent yet to be decided. We will see a Triple Threat Match between Dr. Britt Baker, Nyla Rose and Kylie Rae. SoCal Uncensored (Christopher Daniels, Frankie Kazarian and Scorpio Sky) will face Cima and his tag partners that have yet to be announced in a 6-Man Tag Team Match and lastly, we will see "Hangman" Adam Page face PAC in singles competition. As always continue to follow Sportskeeda for all your wrestling needs!